Wouldn’t it be great if Dr. Joe Vitale spoke to you every morning with inspiring ways to manifest more money and attract more wealth into your life? TOP HABITS THAT ATTRACT MORE MONEY IN 5-MINUTES A DAY. Inspired actions for more money as you Wake UP with Dr. Joe Vitale and daily audio messages. 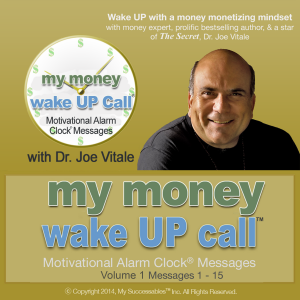 My MoneyWake UP Call Messages™ with Dr. Joe Vitale propel your prosperity with the practical ideas you’ll receive every morning as you wake up ready for inspired action. This is newest series of messages from My Wake UP Call® featuring Dr. Joe Vitale, master money mogul and star teacher in the movie The Secret. Get into the right state of mind to appreciate the abundance that surrounds you as you power up your money manifesting possibilities first thing every morning. Start your day inspired with a monetizing mindset with daily 5-minute messages from Law of Attraction expert, #1 NY Times bestselling author and a star of The Secret!